All year round, bicyclists use pathways throughout New York City to reach their destinations. Have you noticed the many options for these human-powered vehicles? Are you thinking of buying one for yourself? Are you curious about the available choices, or want to know what's new? If so, take a train, walk over or use your current two wheeler and head to the 2012 New Amsterdam Bike Show on Saturday, April 28 and Sunday, April 29. Some bikes sport bright colors. Enjoy the ultra chic venue—Skylight SoHo at 275 Hudson Street. Walk around, hop from one exhibitor booth to another, and chat with participants. Watch a fashion show and catch up on the latest bike apparel trends. Drop by the tent at the Back Terrace and sample cold pints of Dutch Lager, compliments of Grolsch Beer. Don't forget to get some eats from Vandaag and grab a fresh cup of coffee via Brooklyn Roasting Company. The second annual consumer-centric bicycle show benefits Transportation Alternatives. And with over 60 exhibitors, including bicycle makers highlighting their latest rides, you'll most likely find something that suits your needs. 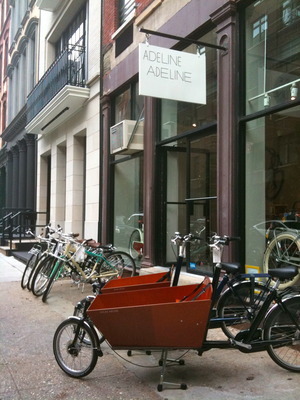 Adeline Adeline, a specialty boutique, showcases their bikes at their TriBeCa storefront. Visit their booth to learn about the newest store offerings. Among the many exhibitors is Adeline Adeline, located at 147 Reade Street in TriBeCa. 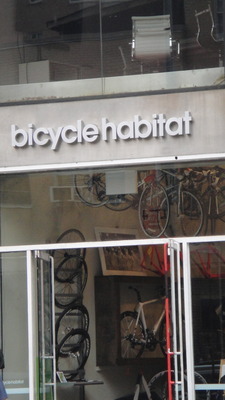 Or stop by Bicycle Habitat, another exhibitor for more choices. How about a new helmet, gloves or other accessories? 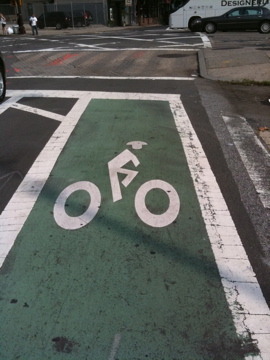 Bicycle Habitat has various locations throughout NYC. Regardless of what ride you decide upon, there are tons of options since bikes come in various styles—appropriate for racing, plus numerous practical versions for recreational and commercial uses. A leisure-type bike with small wheels, used for running errands. Duo of bikes secured to one of many permanent bicycle racks all over NYC. Parked bike even enhances the scenery. All over the city, you'll find environmentally conscious New York businesses, such as Hundred Acres, a restaurant and bar on 38 MacDougal Street in SoHo, utilizing bicycles to deliver food orders. Hundred Acres uses an eco-friendly means to deliver their edibles. Equipped with baskets for delivering food items. A laundry and dry cleaning business delivers the finished products. 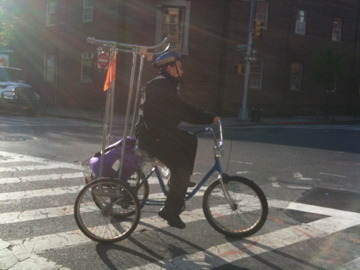 These bicyclists are part of a local operator's tour of the city via two wheels. As New York City expands and enhances its miles of shared bike and pedestrian lanes, many folks are taking advantage of bicycling—a healthier, more economical and eco-friendly way to travel. Join their ranks and support a greener alternative means of transportation. You'll be in great company at the New Amsterdam Bicycle Show, and on the road. Cyclists use shared bike paths to get around the city. Why? Check out the latest rides available at a chic event location. When: Saturday, April 28 to Sunday, April 29 from 10 a.m. to 7 p.m.